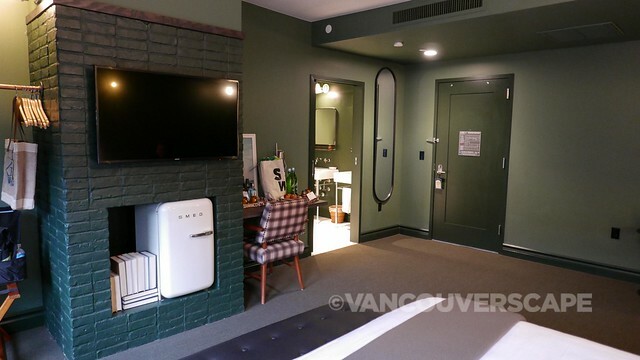 From the moment we enter the lobby of the 96-room Palihotel Seattle, we’re impressed by the sheer amount of detailing throughout the newly-opened property. 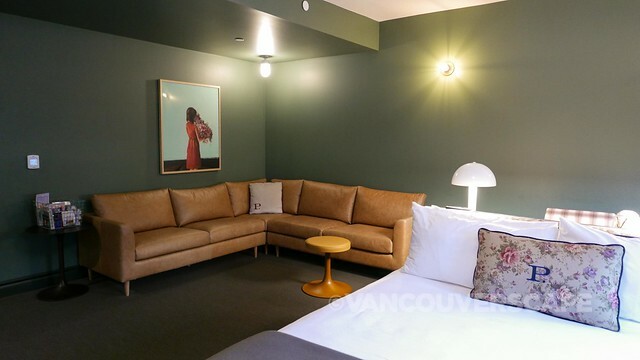 The California-based Palisociety hotel group is known for its design-forward, eclectic approach to style. 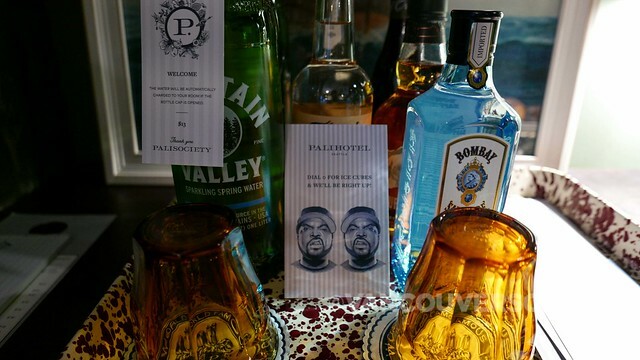 Palihotel’s branding brings Seattle to the forefront with a hand-drawn illustration of a fish, part of a squid and a flower all stylishly grouped with a capital P with a period. 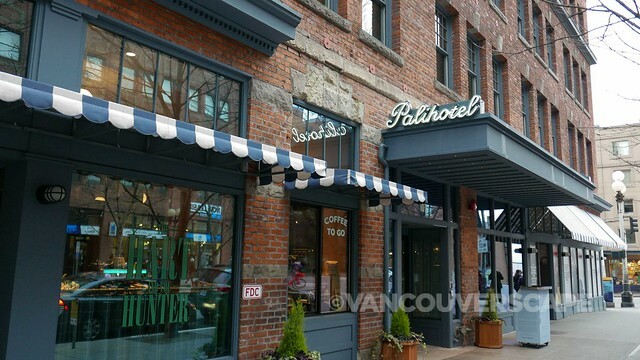 Portland, Oregon will also get a Palihotel down the road. Adjacent to the lobby is a reading room with fireplace, skylights, rows of books (turned around to create a design element rather than a reading library), plants, a variety of prints and artwork, plus a turntable and crate filled with vinyl LPs in the corner. It’s a very inviting space, making it easy to chill here with the hotel’s curated Spotify playlists piped in throughout the day—and a cup of local coffee, craft beer or wine. Fun touches in the room abound, from a matching SMEG tea kettle and mini fridge set to mix-and-match furniture, yet it all comes together nicely to retain a modern-meets-vintage-chic vibe. Our wooden desk has a retro rotary “push button” phone with a letterpress phone directory printed on a classic manila-coloured tag attached by a string. Two white lamps do double duty as work and bedside lighting (rooms here do away with bedside tables). 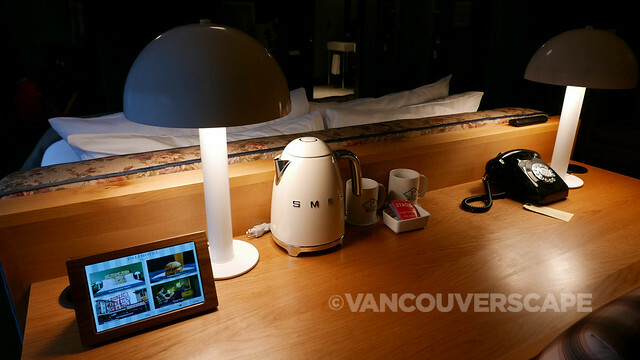 A leather and wood mini tablet with easel stand allows guests to explore the hotel, in-room dining options, the hood (we’re steps away from iconic Pike Place Market) and things to do in the room (a guide on the room’s amenities, including fun little video clips showing various staff members getting a cuppa or brushing their teeth while scrolling their Instagram feeds). The tablet can also alert housekeeping if you need additional towels or toiletries, alert the front desk when to have a bellman come up and assist with luggage or arrange for express checkout. Here’s also where you’ll find a TV channel guide (a smart touch as channels always change up their order and this saves the hotel a lot of paper and printing costs). There are no closets here either: a copper pipe serves as a rack for your clothes. 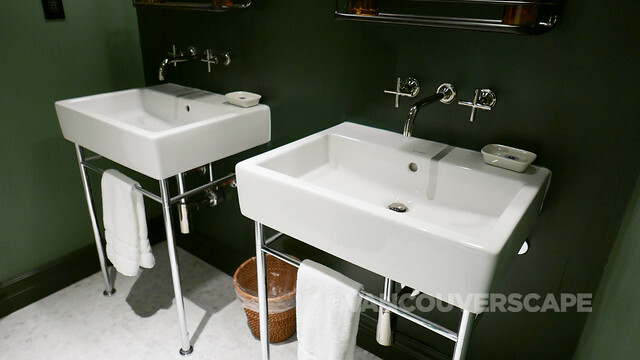 A small desk by the bathroom has a selection of mineral waters and spirits, while a side table near the sectional leather sofa stocks snacks and travel essentials for purchase. The bed is positioned in front of the large desk with a floral embroidered headboard and black leather-topped bench at its foot. 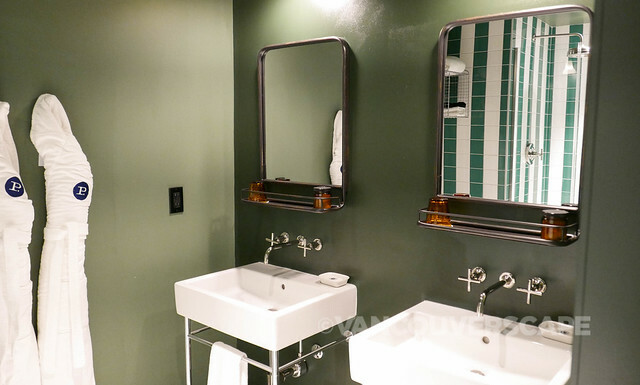 Dark shades of green dominate the walls, with a beautiful green and white-tiled shower and his-and-hers sinks containing modern fixtures. I love the selection of lighting, from the golden hue given off on the bedroom wall behind the desk to the white mushroom lamps on the desk. 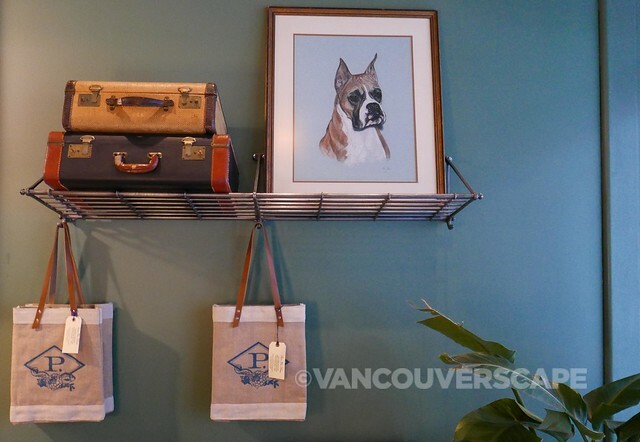 The recurring theme here is thoughtful, detail-rich design. The Hart and The Hunter is one part gourmet coffee bar, one part cocktail bar, one part Southern-inspired meets Pacific Northwest restaurant. 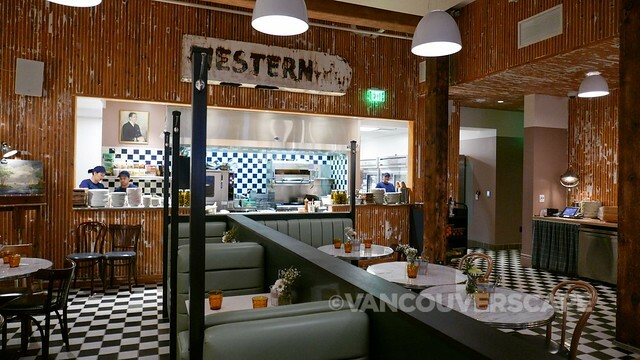 This is the second Hart and The Hunter following the Los Angeles Palihotel-based outpost opened in 2011. 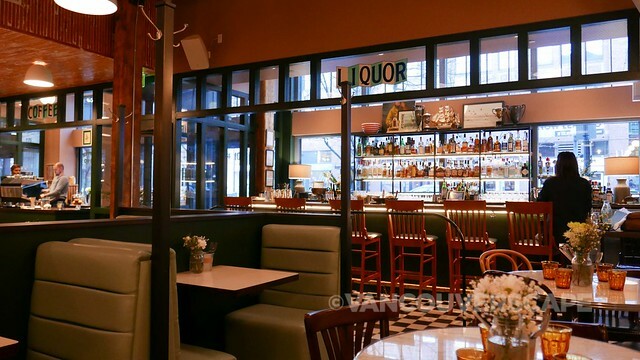 The two-toned green colour scheme continues here with light green upholstered booths lining the center of the room with classic black and white checkered floor tiling. An all-white concrete wall on one side contains white coat hanger pegs; at the opposite side is a row of chrome stools with a service counter. Palisociety has created a series of Spotify playlists to add to the ambience. 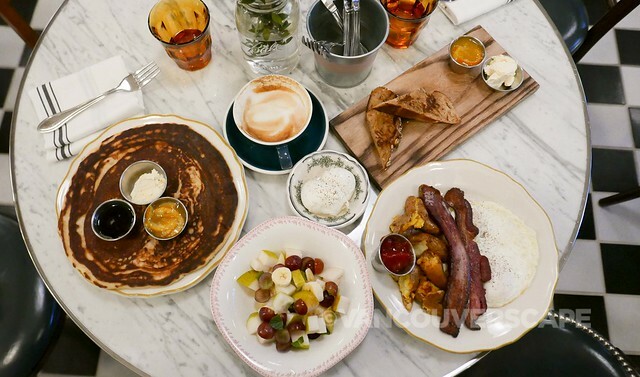 We enjoyed an oatmeal-ricotta pancake served up with salted butter, maple syrup and housemade marmalade, bacon and eggs and our morning coffee fix. Buttermilk biscuits and little neck clams are a couple of the current breakfast plates on offer here. 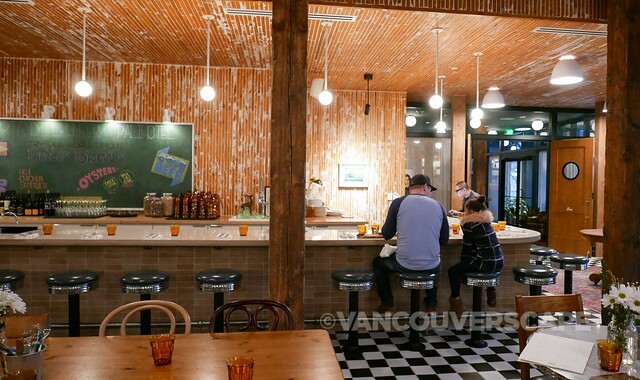 The Hart and The Hunter’s open for breakfast, lunch, weekend brunch, dinner and happy hour. The coffee bar (with a take-away window—a concept we’ve been noticing more here) is open from 7 am to 2 pm Monday to Friday and from 8 am to 3 pm on weekends. 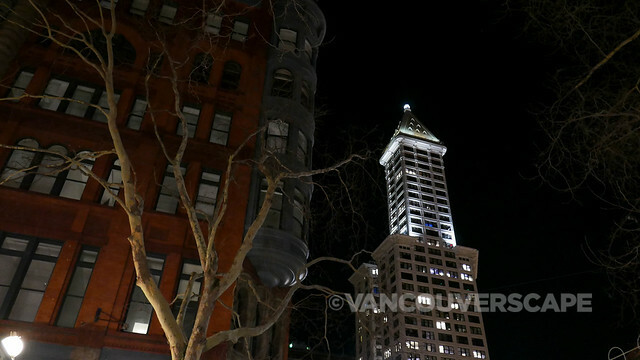 Explore Pike Place Market, get your shopping fix around downtown, take in a day of museums, or simply rent a bike and choose your own adventure. 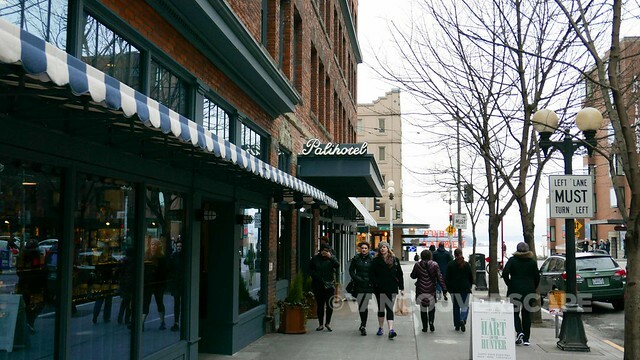 Leave your car with the valet ($55 per night) and explore the city on foot. 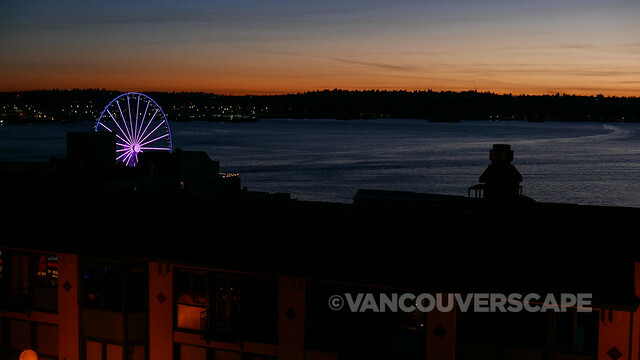 Seattle is a relatively compact city with many of the city’s top attractions in the downtown core. And if your feet tire, there’s always Lyft and Uber at the ready. 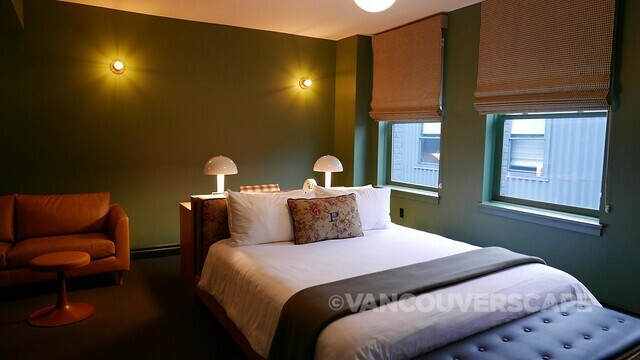 We were guests of Palihotel Seattle courtesy of Visit Seattle. Opinions, as always, are our own.